The final day of my tour around the Czech frontier starts like most of the others have done - eat as much breakfast as possible, pack the bags, load up the bike and pay the hotel bill - but with one notable difference. This time, I’m in the company of my wife Jitka, her cousin Pavla, and Pavla’s ten-year-old son Šimon. If you’ve been following the story, you’ll know that they joined me here in the Polish border town of Cieszyn yesterday after a four-hour train journey from Prague. Together, we are going to ride the last stage of my Circuit Ride to Bohumín, the point where I started it over seven years earlier. From there, we plan to travel home on the late-afternoon express, on which we have reserved spaces for our bikes. I’m looking forward to a relaxed family day out. It should be more procession than sporting endeavour, rather like the last stage of the Tour de France. Hang on, though, doesn’t that always end in a mad sprint to the finish line? After posing for the obligatory group photos outside the hotel, we rode through the historical heart of Cieszyn, crossed the bridge over the Olza (or Olše in Czech) back into the Czech Republic and headed downriver. After passing the site of Stalag VIII B, a former World War II prisoner-of-war camp, we joined a smooth flat highway heading north and soon reached our first planned stop, the “Fish House” (Rybí dům). As the name more than suggests, this is a tourist attraction devoted to all things piscine. We spent some time there feeding ornamental carp and admiring the Slavonic god Veles and other weird and wonderful wood carvings (among them a fishing bear, a shark and - don’t ask, I have no idea - a pregnant woman). Next door was Archeopark Chotěbuz, an open-air folk museum featuring a recreation of an early-Medieval Slavic hillfort. Not until we’d bought our tickets did we learn that the next guided tour was due to start 45 minutes later and would last over an hour. This was no good to us, as we had to get to Bohumín by 4 pm to catch our train home. We weren’t allowed to explore the site on our own, but the Slovak guide very kindly agreed to give us a short private tour. I’m so glad she did, because it was a great place to visit. It was just a shame we didn’t have more time, because we could have easily spent the whole day there and at the Fish House. We continued north along a dedicated cycle trail then crossed a handsome bridge over the Olza into Karviná via Darkov, a health spa established in the 1860s. Karviná is a coal-mining town, but far from being the unlovely place I’d expected, it was rather pretty, especially the main square with its château and adjacent church and park. On the way out of town, I missed a turning and we ended up doing an unnecessary detour. Then we collectively mis-read a road crossing and Pavla fell off her bike and grazed her leg, though fortunately not too seriously. After passing some quite swanky properties on the edge of town, we came to Dolní Markovice, which lies at the base of a small spur of Czech territory jutting north into Poland. My plan had been to ride around the edge of this salient and have lunch at “The Hut at the End of the World” (Koliba na konci světa), a small pub at the north-eastern tip of the Czech Republic. Young Šimon very much liked the sound of this, but his enthusiasm quickly evaporated as we hit the only climb of the day. While waiting for him to push his bike to the top, I consulted Google and discovered that the pub didn’t open until 2 pm. It was currently midday and we still had about 25 miles to go. Did I tell you our train was due to leave just after 4 pm? With morale falling low and time running short, I had to come up with a different plan. More googling revealed a restaurant open on the other side of the salient, just over a mile away. 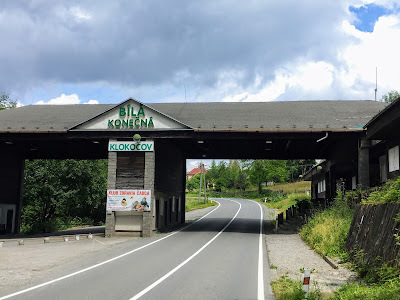 So, Jitka and I continued around the border as planned, while Pavla and Šimon made a beeline for the restaurant, where we would rendezvous for lunch. As Jitka and I entered a delightful wood, a startled buzzard took flight and a tail feather span to the ground nearby. I attached it (the feather, not the bird) to my handlebar bag as a lucky charm, hoping it would help get us to Bohumín in time for our train. We stopped to photograph what turned out to be the last border stone on my Circuit Ride then continued to the Hut at the End of the World, which was indeed closed. 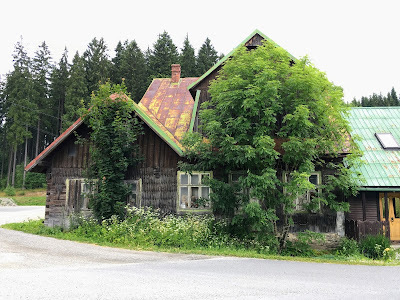 We then came out of the forest and cycled past more up-market houses on a newly laid road to the smart Hotel Dakol, where the other two - sitting on the terrace out back - had already ordered lunch and Pavla was tending to her cycling wounds. Needless to say, the food was slow in coming and we agreed to shorten the rest of our route. Instead of following the river around the back of Bohumín and entering the town from the far side, we decided to head in direct from the east. The planned shortcut also involved fording the river. As this was an unknown in the equation, I went on ahead to scout the situation, only to find that the Olza - a sizeable waterway at the best of times - had been swollen by heavy rains in the night. I waded in and was soon knee-deep in quite fast-flowing water. The only way for us to cross would have been to carry the bikes on our backs. This was too extreme an adventure for a family outing. I phoned Jitka from the middle of the river and told her we had to take the long way round. The other three cycled on ahead while I put my shoes back on and returned to the road. I caught them up just as they were nearing the towering Dětmarovice power station. A quiet cycle trail led round the back of the plant and came out by the river again. Here, Šimon got his wish to cycle through a stream - not the Olza, but a small tributary running into it. The path continuing along the river - the one I’d originally planned to take - was full of freshly laid loose gravel, so the direct route into town was the right choice in the end. We still had some way to go, and Šimon - remember, only ten years old and on a heavy child’s bike - was running out of steam. By now, we were seriously behind schedule. Trying to hide my disquiet, I fed him an emergency muesli bar (only an hour after he’d eaten a huge lunch; the rate at which he burns through calories is astonishing) and instructed him to tuck in behind my rear wheel so we could make faster progress. For the last few miles, I towed him in my slipstream. Finally, at a quarter to four on 6 July 2017, after cycling 1,500 miles over 32 days spread over more than seven years, I rounded the last corner of my Circuit Ride and Bohumín railway station came into view again. I confess I had a tear or two in my eyes as I came to a halt in front of it. There wasn’t much time to celebrate - a hug from Jitka and it was all over. We made it onto the platform only minutes before the train pulled in. Before long, we were hurtling home to Prague. I should be feeling happy, but I’m not. My wife, Jitka, her cousin Pavla and Pavla’s 10-year-old son Šimon have travelled all the way from Prague to Cieszyn in Poland to join me for the final stage of my Circuit Ride tomorrow. For them, the four-hour journey has been a bit of a nightmare, as the train was full to bursting and they struggled to get their bicycles on board at all. So it is them who should be feeling irritated, not me. But no, they are all smiles, whereas I am tired, overwhelmed and - if I’m honest - a tad grumpy. I’m trying to navigate us to our accommodation, but the roads are busy and the area by the railway station is under massive reconstruction and barely passable even on foot. The hotel - when we do eventually reach it - turns out to be in a big car park next to a DIY store and a supermarket. It has no bike store and the lift smells of urine. This is hardly the idyllic reunion I had in mind. In the Czech Republic, the fifth of July is the feast day of Saints Cyril and Methodius, two ninth-century brothers who propagated Christianity in this region and are now venerated as national saints. Not that I felt like venerating them when the church bells outside my hotel room in Jablunkov started ringing in the public holiday before seven in the morning. As a result of the din, I was up and in the breakfast room even before the chef arrived for work. This at least gave me time to mull over my route options for the day. Should I take the low road down the valley via the steel-making town of Třinec? Or should I stick to the plan and head into the hills - specifically the Moravian-Silesian Beskids - further east, closer to the Polish border? I decided to stick to the plan. The climb started after just a couple of miles, by the fire station in Písek. Initially quite arduous, it then flattened out for a while as I entered the dense forest, before kicking up again up to Bahenec Hotel, where I stopped to give my complaining muscles a rest. As it turned out, the really hard work was still ahead of me. In a familiar pattern, the road petered out at higher altitude and became so steep I had to dismount and push my bike through a field for about half a mile to the top. From then on it was up and down, but mostly down, and mostly on rideable trail, to Filipka, where the tarmac started again. On the smooth descent to Nýdek, I whizzed past a family with small children labouring up the other way on their bikes. It struck me as a good way to put one’s offspring off cycling for life. Most places in Nýdek were shut for the public holiday, but I found a nice little restaurant on the edge of town. While I was waiting for my lunch to arrive, my wife texted me to say that she and her two travelling companions had managed to squeeze themselves and their bikes onto the train in Prague and were now heading my way. I meanwhile managed to squeeze a pizza and couple of tasty local Koníček beers into myself and set off again. The road out of Nýdek was properly steep and my legs felt leaden, due possibly to that second beer, but more likely to the cumulative effect of the relentless hills I’d tackled over the past few days. However, the fact that this was the last major climb of my Circuit Ride drove me on to the crest at Gora (which, appropriately, means “mountain”) on the Polish border. As I emerged from the forest, I was greeted by the most amazing vista, stretching from the Beskids across to the Silesian plain. By now I was used to beautiful views, but this was something else. Before long, I was back in the Czech Republic and descending to the Olza valley floor. Below me, various industrial plants were belching fumes from their tall chimneys. I eventually came out on the main road just north of Třinec. It was odd to be on a busy highway after spending the last three days riding solo in the tranquil hills and forests. I felt quite disconnected from this new reality. Fortunately, a cycle path soon took me off the main road and into Český Těšín on the left bank of the Olza. On the opposite side of the river was my destination for the day, Cieszyn. These two towns were in fact a single entity until 1920, when they were divided by the newly created frontier between Czechoslovakia and Poland. Most of the town fell on the Polish side to the east, while the Czechoslovaks had to make do with the smaller western suburb, including the railway station. Nowadays, with Schengen, the two sisters are no longer estranged, but they remain apart. I found a cafe just a stone’s throw from Český Těšín railway station and drank coffee on the terrace there while waiting for the train from Prague to arrive. Sullen storm clouds passed by further to the north and I began to feel hot and bothered in the sultry afternoon air. A wave of fatigue washed over me. I paid for my drink, ambled over to the station and met the others on the platform as they alighted. We were soon crossing the bridge into Cieszyn. Unlike the Czechs, the Poles were evidently not commemorating brothers Cyril and Methodius, as the streets on this side of the border were full of traffic. A shower and a change of clothes put me in a better frame of mind. That evening, the four of us dined in the hotel restaurant. We then strolled down to the main square and wandered around the picturesque historical centre as the light faded and the penultimate day of my ride along the Czech border came to a close.